Musicians have generally had to shy away from slim, light portable PC laptops, but watching the specs on these machines, I’d say that’s finally changing. 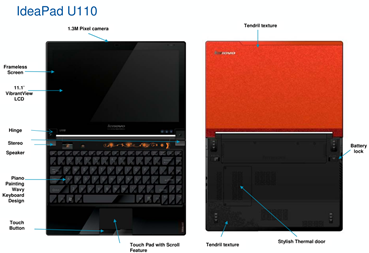 Take the upcoming Lenovo IdeaPad U110. Like the Apple MacBook Air, you have to rely on an external optical drive, but otherwise, this machine comes pretty close to being a worthy mobile music machine. If shedding pounds and size is important to you, there’s no question you could make this box work on the road. There’s not that much of a price premium: it’s US$1899. There’s only a 4200 rpm 120GB hard drive, which would likely be an Achilles’ heal. I do think the ThinkPad comes a heck of a lot closer to the mark than Apple’s MacBook Air, which sacrifices virtually all your ports and expandability — a black mark no matter how pretty the Air is. In fact, a lot of my live Ableton sets fit easily onto a flash drive, so I could imagine popping that into a machine like this. Then again, that’s not really the competition: a US$1000 PC or Mac laptop could easily best these specs with only slightly more power consumption, size, and weight. I still find these machines interesting, though, in that they demonstrate cooler, lighter, smaller, thinner, power-miserly directions for the same laptop platforms — all things that could make their way into more practical machines in the near future. And while I can’t really recommend the Air over the MacBook or MacBook Pro on the Mac side, on the PC side the U110 is at least in the running for those willing to make some (significant) sacrifices, which is a big change from the recent past.